Click the button below to add the Mitochondrial Support to your wish list. The ability of mitochondria to sustain the high energy demands of the brain, liver, heart, muscles, endocrine glands, and other tissues can be compromised by many factors, including exposure to toxins, inadequate antioxidant intake, illness, genetic factors, and a decline in cellular function with increasing age. The accumulated effects of oxidative damage can disrupt mitochondrial membranes and damage lipids, DNA, and proteins, resulting in suboptimal functioning of affected organ systems. Mitochondrial Support is one of the few supplements to include succinic acid, a critical part of the Kreb's energy production cycle in the mitochondria of every cell. 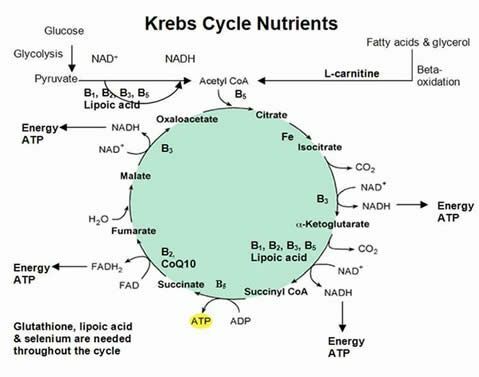 Succinic acid is a critical part of the Kreb's cycle. The natural insecticide found in Bacillus Thuringiensis (Bt) which is widely used on organic crops and also genetically engineered into Bt corn and potatoes, reduces the availability of succinic acid for Kreb's cycle energy production. Bt kills insects when the insect consumes a plant that contains the Bt protein. The protein binds to and ruptures the gut wall, causing leaky gut. Within hours, the gut wall breaks down and normal gut bacteria invade the body cavity. The insect dies of blood poisoning as bacteria multiply in the blood. Wilcks A, Hansen BM, Hendriksen NB, Licht TR. Persistence of Bacillus thuringiensis bioinsecticides in the gut of human-flora-associated rats. FEMS Immunol Med Microbiol. 2006 Dec;48(3):410-8. Epub 2006 Nov 7. Ghelardi E, Celandroni F, Salvetti S, Fiscarelli E, Senesi S. Bacillus thuringiensis pulmonary infection: critical role for bacterial membrane-damaging toxins and host neutrophils. Microbes Infect. 2007 Apr;9(5):591-8. Epub 2007 Feb 16. Peker E, Cagan E, Dogan M, Kilic A, Caksen H, Yesilmen O. Periorbital cellulitis caused by Bacillus thuringiensis. Eur J Ophthalmol. 2010 Jan-Feb;20(1):243-5.